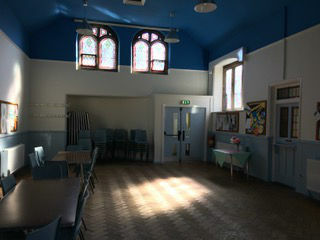 We have three room spaces available for booking by outside groups - the church building itself, the main hall and a small hall. The hall measures about 25m x 12m and can take 13 tables and 60 chairs. There is also a stage which can be used for performances. In the church area there is a projector and sound system. A local cafe, Country Kitchen Cafe in Waddington, can supply catering if required. To contact them, phone: 01200 429364. Sessions of 3.5 hours in the main hall or the church cost £24 + £11 for heating, if required. Sessions in the small hall cost £10. A projection screen and stand are also available. Click this link to send an email for further information or to make a booking.